Cabarete is a small, low-key and laid-back Caribbean beach village located just 20 minutes away from the Puerto Plata airport on the north shore of the Dominican Republic. Its an ideal tropical paradise vacation spot, especially for the young traveler seeking fun, new friends and sporting adventure. With its charming, cool/hip ambience and combination of relaxed and adventurous lifestyles, most visitors can barely resist the spontaneous temptation to extend their stay and just hang around the place for awhile longer. The village is spread out across the center of a gorgeous, seemingly endless, semi-circular beach of sun-soaked, fine golden sand. Just behind this, and limiting its size, lies a large tranquil lagoon, backed up by richly verdant hills overflowing with luxurious tropical vegetation. behind the village which cause a unique thermal effect  form not only a beautiful layout. They also create an unusual synthesis of really outstanding wind and wave conditions. 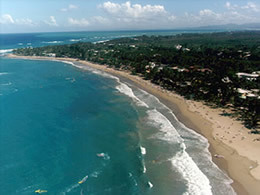 This makes Cabarete bay an exceptional location for the high energy and exciting water-sports of kiteboarding and windsurfing, or for regular surfing on the Encuentro beach located just around the corner from it. Its also the perfect place for just lounging back and crashing to get that perfect tan when youre not out playing in, or gliding over, the soothing, warm Caribbean water, or participating in some other fun adventure sport, such as mountain-biking, scuba-diving, wakeboarding, cave exploring or canyoning. Another alternative to pass the time pleasantly is chilling out in your swimwear while sipping a cool Rum Punch or sampling the great local Presidente beer at one of Cabaretes several informal beach-bars. Time goes by quickly while casually mingling with the locals or other interesting international travelers from every corner of the globe. The beachfront also hosts several casual restaurants which serve diverse menus of tasty dishes of both local and international cuisine, listed at very reasonable prices. Diners can choose from quite a wide selection, including fresh delicious seafood such as dorado, lobster or shrimp, or - for a change of pace - can opt for sampling the Dominican specialty of Creole chicken with rice and beans. Many youthful and young-at-heart vacationers play hard at night in Cabarete too, partying late until the wee hours. Most beach bars are really cool places to just hang around in and put down a few Cuba Libras before hitting the sack (the locally brewed rums are of quite high quality). 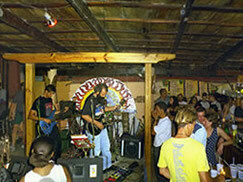 To liven things up a bit, several of the most popular bars on the beach regularly host Live local bands - including some reputable groups from the capital who have made their own recordings. These play Rock-favorites like Jimi Hendrix or Santana, the occasional Blues or Jazz, or groovin Reggae tunes to sway along with. For those with more energy who want to swing the night away to the dynamic sounds of more Latino-flavored and local music, its never possible to ever forget while youre here that this is the land of the meringue. The disco dance floor is always jam-packed, especially just after midnight, with both locals and visitors showing off their stuff, or just learning how to master the steps of both meringue and the occasional bachata or salsa, with some modern techno-music thrown in for variety. Visit ActiveCabarete.com for more info about Cabarete.